In what could only be described as a vile violation of human dignity, United Airlines had aviation police officers forcibly drag a passenger off a flight headed from Chicago to Louisville. The incident quickly went viral, causing a storm of anger on Twitter. But it turns out some of the negative tweets are now mysteriously disappearing. 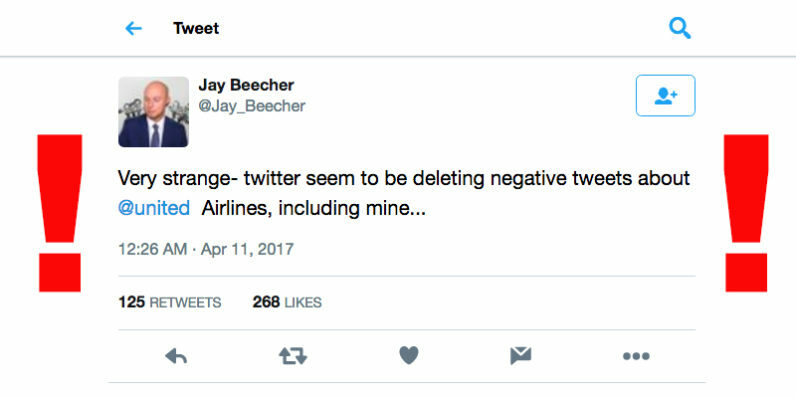 Numerous users are reporting their negative tweets criticizing United Airlines’ abusive behavior have been vanishing into of thin air – and nobody seems to know why. While Twitter has previously hidden tweets containing offensive messages from showing up in other people’s timelines as part of its efforts to curb abuse on its platform, deleting tweets against users’ wills goes firmly against the company’s rules. This sort of moderation is more commonly known as ‘ghost-deleting.’ The term is a little misleading since such tweets are technically not deleted, but merely prevented from appearing in users’ feeds. This measure, however, is usually reserved strictly for offensive tweets – and this is hardly the case here. Even more confusing is the fact some of the initial tweets exposing United Airlines’ abusive treatment of passengers are still very much present and actively being reshared on the platform. We have since contacted some of the users who claimed their tweets have been deleted and some of them have confirmed this is indeed the case. “I can’t seem to find [the tweet anymore],” a user who preferred to remain anonymous told TNW. The individual further remarked that following the unexpected disappearance, they sent “one or two more” tweets that, while similar, weren’t removed from the platform. I think that they might have been deleting any [tweets] that had the United Airlines tag on them. I found [the deleting] was pretty much automatic. I would put the tweet up, click refresh or go to another page and then return to mine, and the tweet would have disappeared. On another note, United Airlines was trending and prominently appearing in Moments after the story initially broke yesterday, but it seems it now has been pulled from both. @Jay_Beecher @united They took the topic off the “moments” as well. Still happened guys. We have reached out to Twitter for further comment and will update this piece accordingly if we hear back. Update 1, April 11, 11:10ET: A previous version of this post stated that United Airlines employees were responsible for removing the passenger in question. This is incorrect – it was aviation police officers that performed the removal. We regret this mistake and have updated the post to reflect this accurately. Update 2, April 11, 11:15ET: Some readers have suggested that the allegedly deleted tweets might have initially appeared as replies to now-deleted tweets, which would explain why they are missing. However, numerous users contacted by TNW rejected this premise, claiming the missing posts were standard tweets.